As the world becomes more urbanized, data on cities and the residents who inhabit them is key to building and governing sustainable communities. Yet this data is simply not available for many rural and urban areas around the world. Many cities lack base data sets—such as accurate maps of their cities that identify key infrastructure, services, and human settlements. In some cases, these maps exist on paper, but in other cases, are only available in closed, proprietary systems or not at all. This was the case in the Liberian cities of Ganta, Gbarnga, and Zwedru. As Liberia’s government moves to decentralize, data-driven governance of cities takes on an increasingly important role. The DAI-led Local Empowerment for Government Inclusion and Transparency (LEGIT) program, funded by the U.S. Agency for International Development, is helping solidify this process by facilitating the transfer of authority from the national government to counties and cities, enhancing citizen participation in governance, and building the capacity of government officials. Ganta, which is interchangeably called Gompa meaning “man’s home” in the Mano dialect, is the fastest-growing and second-largest city in Liberia after Monrovia, owing to economic activities and its proximity to Guinea and Côte d’Ivoire. As such, volunteers had more commercial buildings and services to map compared to Zwedru. Prior to the mapping exercise, the Gompa City Corporation did not have updated nor properly scaled maps. In 2016, volunteer field mapping was conducted in Ganta as part of the American Red Cross West Africa Mapping Project aimed at filling the information gaps that made it difficult to fight Ebola during the 2014 to 2015 outbreak in the region. The LEGIT mapping process reinforces those efforts by providing even more details of Ganta. A mapping team strategizes how to map their task for the day. Following up the mobile data collection and mapping training, our volunteers were motivated to map the city and its surrounding villages within an eight-mile radius. With a passionate spirit and “we’ve got to map our city” attitude of our volunteers, we were able to cover a lot of ground in a short period. 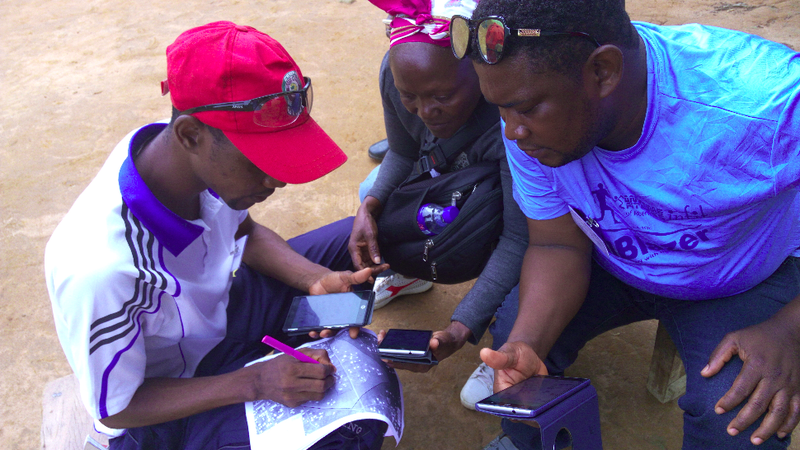 Despite the dense urban area, the mapping process in Ganta was completed in time, allowing volunteers time to participate in data cleaning and upload, as well as install mapping tools into their personal phones. Volunteers participate in data cleaning before uploading. Street names are still not clearly defined in Ganta. The problem is that the names used to name streets were not known to the city inhabitants, and therefore they did not use them. This was evidenced in the surveyor’s map from 1979 that was discovered in the possession of a local drafter. Upon close examination, the map was found to be largely inaccurate to the ground reality of present-day streets layouts, and names did not reflect current use. However, this map did provide interesting insight on how Ganta developed after Liberia’s civil wars disrupted city planning. In response to HOT’s mapping efforts, the City Corporation and the council members are assigning proper names to the streets, with justification for proper identification. 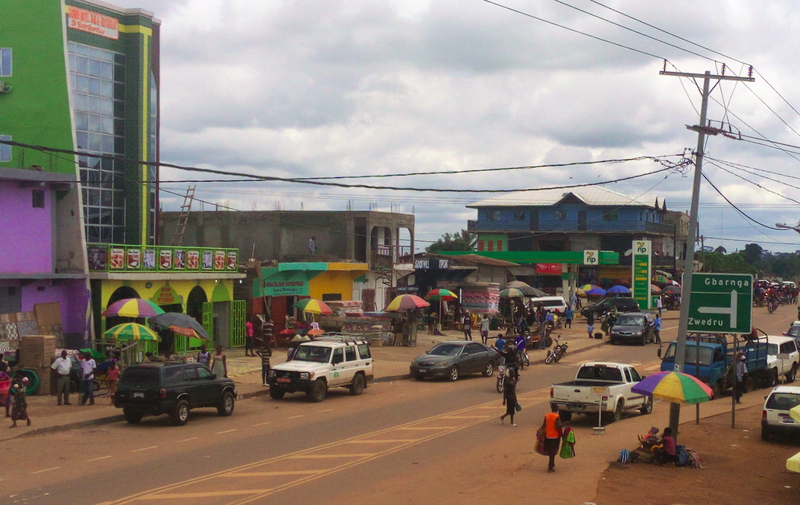 Gbarnga was the last of the three cities to map in Liberia with DAI for the LEGIT Project. Gbarnga is the capital city of Bong County, northeast of Monrovia. Despite the onset of the rainy season, volunteers were able to map the entire eight-mile radius of Gbarnga. Volunteers walked through forests, wetlands, crossing rivers and creeks, even forging their own paths through the forest to get to these villages. In Gbarnga, as with other parts of Liberia, there are still villages that are not accessible by road. Many of these villages are blocked by rivers and creeks that get flooded during rainy seasons. This situation makes it difficult for rural inhabitants to access basic medical care and markets for their agricultural products. On occasion, teams needed the help of community members to cross these flooded waterways—not using keno or boat, but rather, on pieces of log woods tied together. It was a difficult task mapping the rural reaches of Gbarnga, but our strong volunteers successfully mapped those hard-to-reach villages. The importance of mapping was highlighted and appreciated during meetings with security agencies such as the Regional Police Hub, Prison Compound, and Camp Tubman Military Barracks in Gbarnga. While meeting with the HOT team, Barracks Commander Col. David Cooper requested the HOT team to present the importance of the mapping exercise and the possibilities of mapping to families living in Camp Tubman Army Barracks. With more than 100 army officers in attendance, Country Manager David Luswata conducted a brief presentation on the background of LEGIT and the importance of mapping in peacekeeping and ongoing reconciliation efforts in Liberia between different groups of society. During the mapping process, Jeremy Meadows, USAID Director of Democracy and Governance Office, visited the teams in Gbarnga to learn more about the process, how volunteers were performing, and how mapping will help the city and country at large. Guests received a short overview of the project and its activities and headed to the field to meet volunteers. The volunteers demonstrated field data collection with smartphones using different mapping tools on including Open Data Kit (ODK), OpenMapKit (OMK), and OSMAnd. After data cleaning and upload, the second phase of the project will focus on creating maps in QGIS with map data for stakeholders to use in development and planning. In the coming months, the HOT team will also provide QGIS and mapping training sessions for volunteers and stakeholders in the three project cities. Additionally, HOT will continue building the capacity of local stakeholders, local organizations, OpenStreetMap Liberia/Youth Mappers chapters, and higher education institutions in Liberia to continue putting the country on the map. A version of this article originally appeared on the Humanitarian OpenStreetMap Team’s (HOT) blog . All images are courtesy of HOT.